I’m taking a break from our road trip in France to talk about my second favorite season in Warsaw! Fall has arrived in full force, bringing its colorful leaves and patterns throughout the city. Even if the skies are slightly overcast or gray, you can’t help but notice the city’s golden yellows, crimson reds, pumpkin-like oranges all around you. And when you get a sunny day like yesterday, the city looks really beautiful! Warsaw has dozens and dozens of parks. If you remember, I’ve mentioned before that these plentiful parks are just one of my Top 10 Reasons to Love Living in Warsaw. This past week, I wandered through a few of them to capture the autumnal beauty. Pretty trees in Pole Mokotowskie Park. 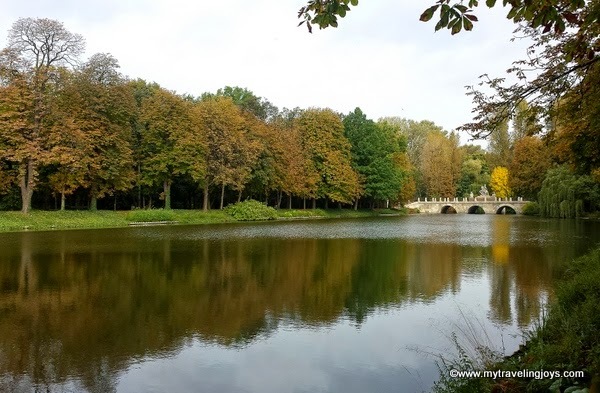 Nearly every Thursday morning, I power walk through Łazienki Park with a group of expat women. This park, with its central location, is one of my favorites and easy to access by public transportation and by bike. The park also is simply splendid during our short fall season. Then, earlier this week, I ended up down in the Ursynow neighborhood for a doctor’s appointment and decided to kill some time strolling through the nearby Dolina Sluzewiecka Park. I couldn’t find any information about this park, but I can tell you it’s BIG and has a nice stream running through it, walking and bike trails as well as a couple of ponds – currently home to many ducks and a few fishermen. I always love discovering a new part of Warsaw so this park was a pleasant surprise, especially by the Służewski Dom Kultury w Dzielnicy Mokotów, a community center, I think. I found a wonderful plank walkway and a well-paved path behind the wooden buildings and garden area. When I discover random gems like this, I wish I spoke better Polish so I learn more about these places. It's not very often that I see a stray cat in Warsaw! 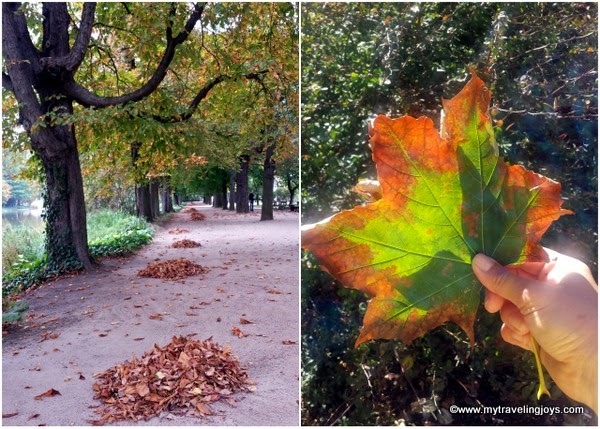 So these 10 photos give you an early snapshot of what fall is like in Warsaw. I’m sure I’ll be sharing more fall photos soon! Warsaw looks so pretty in autumn colours. I'd love to go back and spend more time there although I'm not sure I can drag myself away from Berlin right now. it looks so similar to here. this is probably why we have so many polish people who settled in this city. it reminded them of home. @Joyce, You're probably not too far from the truth with that thought! Beautiful photos, and so glad you shared them!